Is the TDF becoming boring? (Image: Sky). Even the most ardent critic of French table wine would be hard pressed convincing even the most ignorant of oenophiles that Chris Froome was doused in a glass of warm Chardonnay rather than the end product of a session on the sauce last week. With the exception of some of the outspoken armchair Paul Kimmages on Twitter – whose sole raison d’etre seems to be spewing forth negative toxicity and lazy skepticism – no one would disagree that having one’s face showered in urine while riding in the fierce heat of the Massif Central is nothing but “extremely, extremely wrong – on so many levels”. Froome is right to be “really disappointed”. He is right that what happened to him was “absolutely disgusting” and “extremely disrespectful”. And while he underplayed it somewhat by saying it was only merely “quite unfortunate” he’s bang on in his assertion that such a practice “is not sporting”. Heck, I’d go as far to say that it wasn’t so much ‘not in the name of sport’ as opposing all levels of basic human decency. It’s one thing pulling moonies on the side of the road – as practically half the population of 20-something male fans at the Tour this year seem to be doing. It’s perhaps understandable, if not exactly acceptable, that some of these flashing fans (not to mention those prudish souls keeping their clothes on) find it in themselves to shout “dopés” at the cyclists as they fly past. But punching Richie Porte purely because he’s wearing a Team Sky jersey? Throwing urine at the yellow jersey? This has gone way too far. Those riders in question are under no illusions that the press has helped create an atmosphere where other journalists are forced to report on such behaviour on their front pages rather than the race itself. “I think some of the reporting on the race has been, erm, how do I say, erm… it hasn’t been professional. And I think that’s what’s led to this incident today,” Froome said in his post-stage interview at Mende after Britain’s Steve Cummings became the third British rider after Mark Cavendish and the yellow jersey to snare a stage on this year’s race. As for Porte, in a frank and moving interview with Richard Moore of the Cycling Podcast he asserted that the “journalists whipping up all the rubbish” needed “to be held a little bit accountable for our safety as well”. “Do I deserve to be booed? Does Chris Froome deserve to have all this? I don’t think so. Maybe in ten years time they’re going to see that all these victories are legitimate. I still don’t expect them to come back and apologise but I just think it’s a disgrace how some of these people carry on,” he said. Porte stressed that he’d “put his hand in the fire” for any of his Sky teammates because he knew they’re efforts were all “legitimate”. The French media has been especially cynical of Sky’s performances, with Pierre Ballester – one of the journalists responsible for bringing down Lance Armstrong – telling newspaper La Libération that Sky were “killing the Tour” while comparing Froome to the shamed American. In his role as cycling consultant for French TV and radio, former French cyclist Laurent Jalabert has particularly irked Sky by claiming Froome was “on another planet” – deliberately using the same vernacular that was famously used by L’Équipe in describing Armstrong’s performances. “It’s surreal to see just how superior Froome is, with that super astonishing style, turning the legs at a phenomenal rate on gradients touching 15 per cent,” Jalabert told RTL Radio after Froome’s win at La Pierre-Saint-Martin. For a man who was left feeling more than a bit uncomfortable after being named in the French senate report of 2013 as having traces of EPO found in his urine from the 1998 Tour, Jalabert’s words reeked of hypocrisy. So much so that his British TV counterparts took Jalabert to task one day in the media zone, with ITV‘s Matt Rendall asking him to explain the cynicism and insinuation behind his belief that Froome’s performances were “verging on the ridiculous”. Jalabert’s bizarre assertion that he was “just a spectator” at the race seemed at odds with his professional role during the Tour and his very presence in the media zone with a press pass dangling around his neck – and when put on the spot about his own alleged doping indiscretions, Jalabert kept very quiet, choosing instead to flee the scene. In fact, it made me think back to the 1995 Tour de France when Jalabert roared up the Col de la Croix Neuve in Mende to finish more than five minutes ahead of Miguel Indurain, the defending champion. Such was the ferocity of Jalabert’s performance they renamed the climb the Montée Jalabert – although it was switched back following the former green and polka-dot jersey winner’s fall from grace in 2013. Which brings me neatly to one stat that should shut the bilious traps of Jalabert et al. For all this talk of ridiculous time losses, it’s worth highlighting that if you take out the opening time trial, the team time trial and the crosswind splits in Stage 2 Froome has only taken 1:16 out of Nairo Quintana in three uphill finales – and where’s the cup of piss dripping off the Colombian’s brow? Such paltry time gaps are hardly the stuff of aliens from another planet. Sure, Froome has made the likes of Vincenzo Nibali, Alberto Contador, Thibaut Pinot, Jean-Christophe Peraud and Romain Bardet look fairly ordinary – but is that so much of a surprise? Victims of their own hype following last year’s success in the absence of Froome, the Frenchmen were out of touch after the first three stages, Nibali, like Bradley Wiggins after his Tour victory, has been inconsistent all year, while Contador arrived at the Tour after winning a particularly testing Giro d’Italia. As for Quintana – he may yet come to life in the Alps. So until you have some facts and more than just a gut-feeling, forget all this lazy doping innuendo. 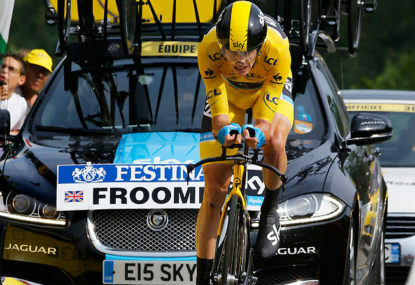 What would really be criminal would be if Chris Froome was not winning this Tour by three minutes ahead of the Alps. Criminal, for sure, yet not punishable by a glass of urine to the face – not even the most acidic and tasteless of French vins de table.